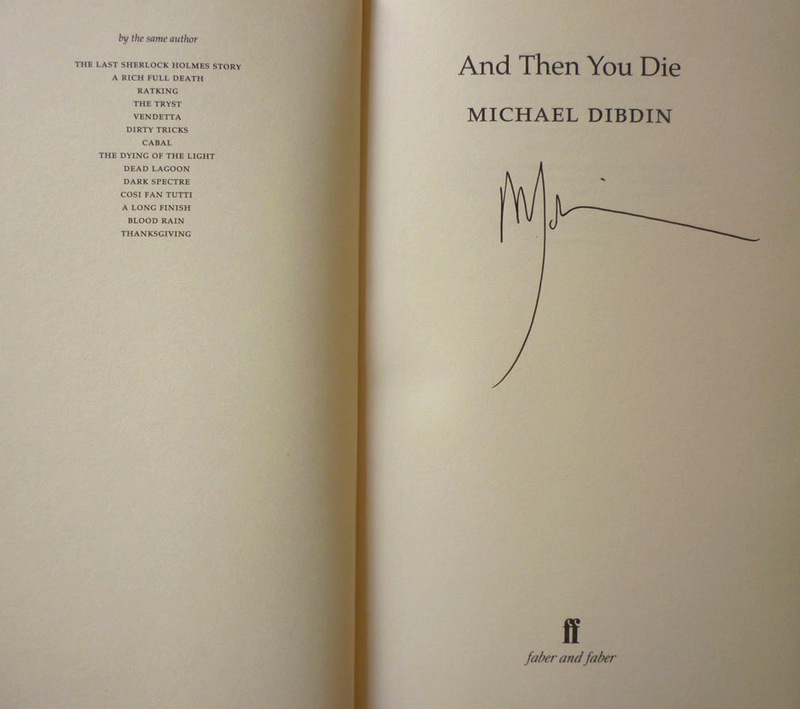 This is the UK hardback first edition/first printing of And Then You Die, published by Faber & Faber in 2002, with a dustjacket designed by Pentagram. It's the eighth in the late Mr. Dibdin's eleven-novel series starring Commissioner Aurelio Zen, a detective in the Italian police service, attached to the Ministry of the Interior. 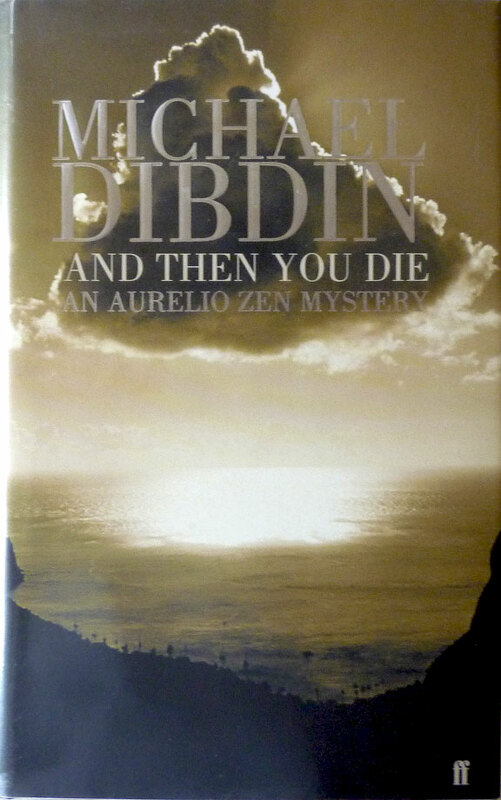 Now, I have to admit, I wasn't really aware of Dibdin or Zen until the start of this year, when the Beeb broadcast Zen, three feature-length adaptations of the first three books in the series (in a mixed-up order). It was perfect Sunday night viewing: witty, stylish, and with a charismatic central performance by Rufus Sewell as the Venetian-born, Rome-based Zen. Mystifyingly, the BBC elected not to renew the series, BBC One controller Danny Cohen reasoning that there were already too many male detectives and crime shows airing. Which is true in as much as there are a lot of TV 'tec shows, but rather ignores the fact that the majority of them are rubbish – whereas Zen was not. Pillock. 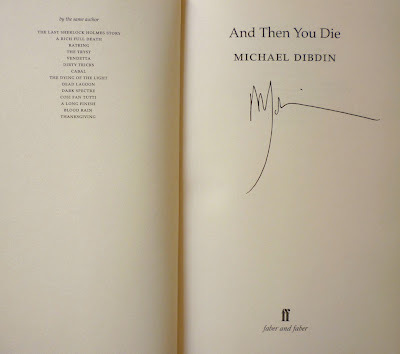 Michael Dibdin's signature. I took the stack of books to the counter in the hope that the man at the till wouldn't spot the signature and would sell me the book at the same price as the others. Unfortunately, however, he did notice it. 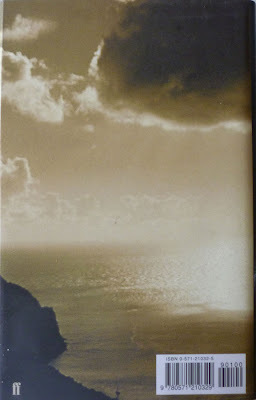 But after a moment's thought, he proposed a price of £15, which sounded to me at the time very reasonable indeed. And I've since learned it was even more reasonable than I figured: there's a Faber first on eBay at the moment for £40, and only two others on AbeBooks, priced at £65 and £85. As to the veracity of the signature, I've checked it against other examples of Dibdin's autograph, and can confidently state that it's the genuine article. Matter of fact, one of the signatures I compared it to was one in another Dibdin first edition I scored, this time at the most recent Lewes Book Fair, back at the beginning of August. I'll be blogging about that book at the climax of this series on signed editions, but next I'll be turning to an author who's a firm favourite of mine, a British thriller writer who I don't believe signed many books in his lifetime, and yet who I've managed to secure two first editions bearing inscriptions by him.